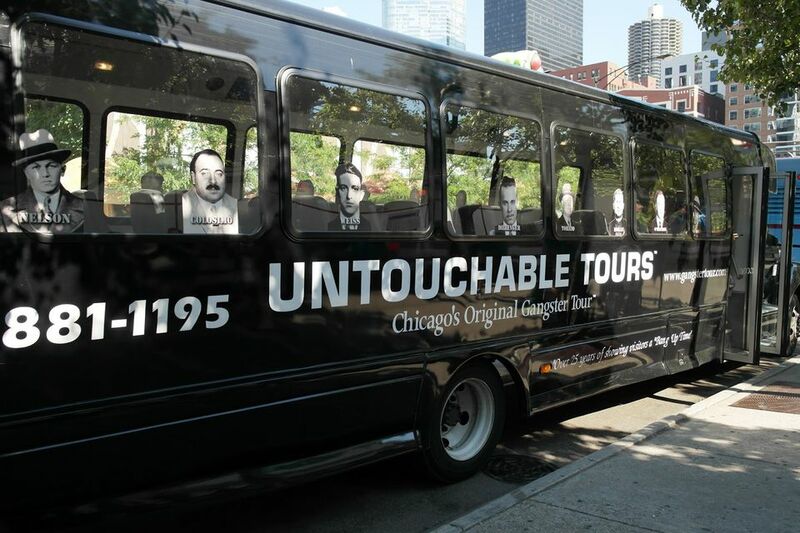 Untouchable Tours bills itself as "Chicago's Original Gangster Tour," a two-hour driving tour in a jet black school bus to be shown many of the city's notorious gangster landmarks and hangouts, particularly those of Al Capone. The tour guides wear Prohibition period costumes and get into the gangster role. Expect to hear a lot of "dees, dems and does," as in "dees guys, dem dolls and does times." Untouchable Tours buses leave from in front of the "Rock 'n Roll" McDonald's at 600 N. Clark St. (at Ohio), a short distance from most of the city's popular hotels. Red Line train to Grand, approximately .25 mile walk to Clark & Ohio. Closest indoor parking is available in garages located on Ohio between Dearborn & State and on Ontario between Dearborn & State. Untouchable Tours run seven days a week, and many days offer several departure times especially on weekends during the summer. All Untouchable Tours are approximately two hours long. Chicago is still widely known for its connection to Depression-era gangsters like Al Capone and John Dillinger, even though most of them faded away shortly after the repeal of Prohibition in 1933. That's why Untouchable Tours, which visits historical spots from that period around the city, remains one of the more popular guided tours in Chicago. And don't expect a humdrum guide's rote spiel as they go through the motions. Instead, Untouchable Tours amps up the fun by having their guides dress and act like characters straight out of the 1920s and 1930s, and the tours take place on school buses painted jet black. With names like "Al Dente", "Shoulders" and "Southside", these guides will make sure your tour is very memorable. The tour features plenty of hot spots and stories about infamous names of local gangster history. Besides Dillinger and Capone, the tour features other gangsters such as "Machine Gun" Jack McGurn, Johnny Torrio, Bugs Moran, and Dion O'Bannion. The two-hour tour travels the city to visit various old "hoodlum haunts" and scenes of crimes such as the Valentine's Day Massacre. So if you have a strong (or even perfunctory) interest in Chicago's gangster criminal past, then Untouchable Tours should certainly be added to your itinerary during your visit. Biograph Theatre: The Biograph Theater on Lincoln Avenue on Chicago's North Side is the infamous site where, in 1934, FBI agents lay in wait for gangster John Dillinger and gunned him down as he was exiting from a movie and drew a gun on the agents. Now home to the Victory Gardens Theater, the exterior of the Biograph was temporarily restored to its former glory for the filming of the Johnny Depp biopic Public Enemies. 2433 N. Lincoln Ave.
Mount Carmel Catholic Cemetery: Mount Carmel Catholic Cemetery has the honor of being the final resting place of the most notorious of Chicago gangsters, Al Capone. The cemetery is just outside Chicago in west suburban Hillside off the I-290 expressway. Besides Capone there are other gangsters from the era buried there like "Deany" O'Banion and the "Terrible" Genna brothers. 1400 S. Wolf Rd., Hillside, Ill.
Valentine's Day Massacre Site: On Feb. 14, 1929, seven gangsters were shot and killed at a garage in Chicago's Lincoln Park neighborhood in what became known as the "St. Valentine's Day Massacre." While it was never proven, it's commonly believed that the men were murdered by members of Al Capone's gang, or hit men hired by Capone. The killers tricked the gangsters into letting them in by dressing as police officers. The main intended target, "Bugs" Moran, escaped injury when the "go ahead" signal was mistakenly given early and Moran had not arrived at the garage yet. Unfortunately a visit to the site is just to have an "I was there" moment, as the original building is long gone. 2122 N. Clark St.